October 12 and 13, 2013 was this year's Open House New York (OHNY) weekend. It is the one weekend each year when New York City opens its doors to the public. The OHNY weekend gives rare access into the extraordinary architecture that defines New York City from private residences and historic landmarks, to hard hat tours and sustainable skyscrapers. openhousenewyork (OHNY) is a non-profit cultural organization founded in 2001 in New York City, to promote awareness and appreciation of New York's architecture, design and cultural heritage through year-round, educational programs. Through direct experiences and dialogue with architects, designers, planners, and scholars, OHNY opens doors for the public to discover new work, restoration of city landmarks, construction of infrastructure and engineering works and neighborhood planning efforts. 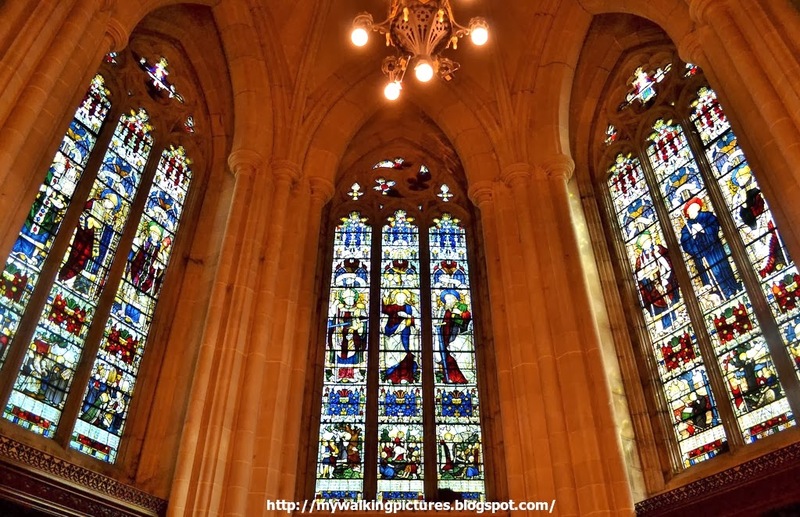 My top choices for the weekend were the tours of the Trinity Church bell towers and the World Trade Center Tower 4 but when I tried to make reservations the first hour the tours were made available, they were already sold out. 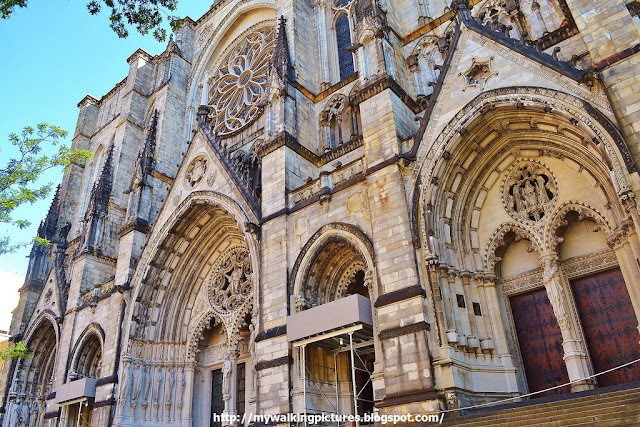 Reservations to OHNY participating sites get sold out so quickly, luckily I was able to secure one for the Cathedral of St. John the Divine Highlights Tour. I've been to the Cathedral of St. John the Divine before, and even posted some pics in a previous blog, but I know I could learn something new with the OHNY tour. The Highlights Tour focused on the stained glass windows of the church, the chevet of chapels at the back, and some of the items in the High Altar. 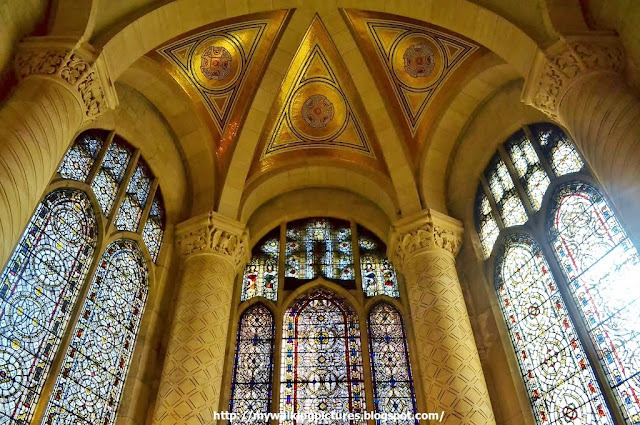 The cathedral's nave has fourteen themed bays honoring professions and human endeavor, each with corresponding stained-glass windows. 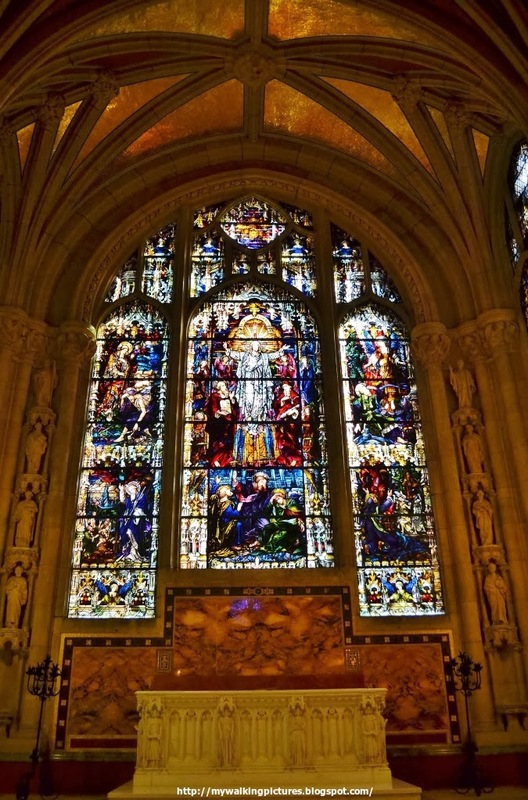 The stained glass windows depict different scenes, some religious, some about history while others show scenes from the modern world like a 1925 prototype television. Here's a close-up of one of the stained glass windows, I think this is from the 'American' theme. You can make out the words describing the scenes, like Washington at Valley Forge on the upper left of the photo below. The Cathedral of St. John the Divine is still a work in progress. 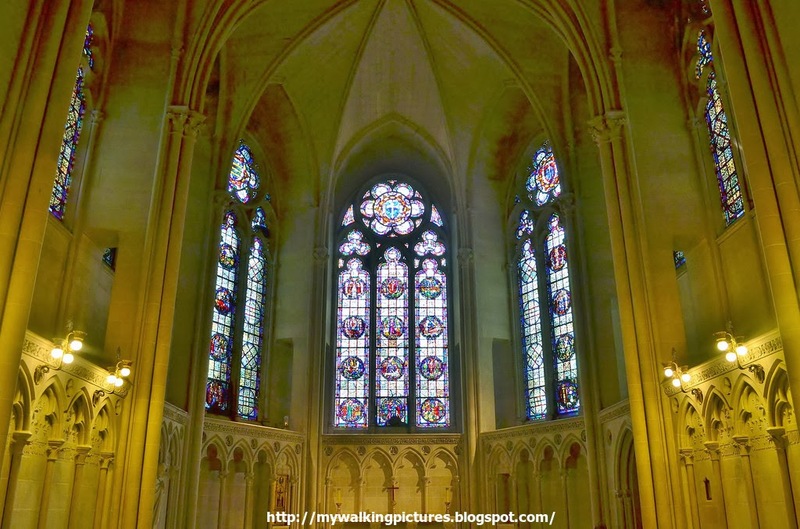 After years of intermittent construction, the present structure of the Cathedral that is finished includes the Crypt, Choir, Crossing and the beautiful chevet of chapels, called the Seven Chapels of Tongues, which surround the Choir. 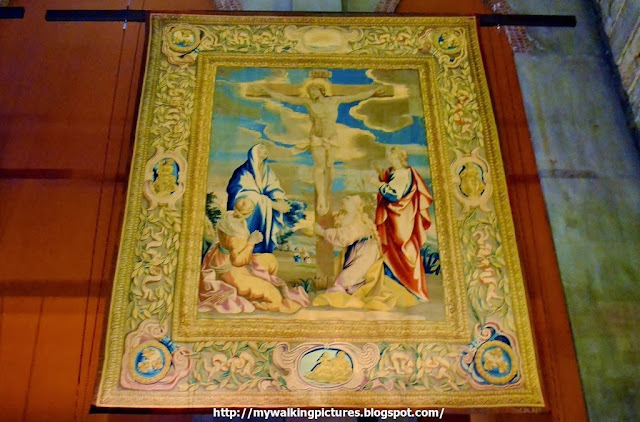 The Cathedral's treasures include the Barberini Tapestries, twelve rare 17th-century tapestries, designed by a master of the Italian Baroque and hand-woven in a workshop in Rome, which were presented to the church in 1891. Two of these large tapestries were severely damaged during the 2001 fire that swept across the north transept of the church. Four of the 16-feet tapestries hung at the Crossing. This is The Crucifixion tapestry, after some cleaning, interstitial weaving, spot patching and overall reinforcement done by the cathedral’s Textile Conservation Laboratory. 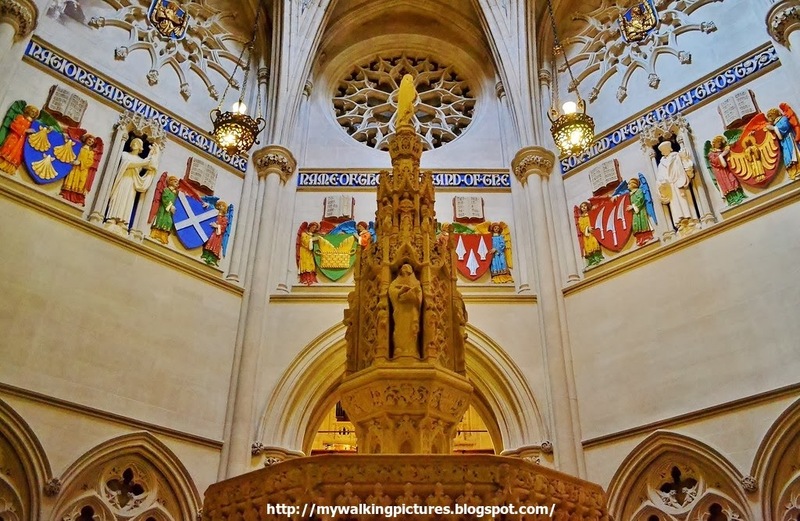 In the Crossing also stands the white marble pulpit, a gift of Mrs. Russell Sage, exquisitely carved, with panels representing scenes in the life of Our Lord. You can see two more of the tapestries hanging behind the pulpit. 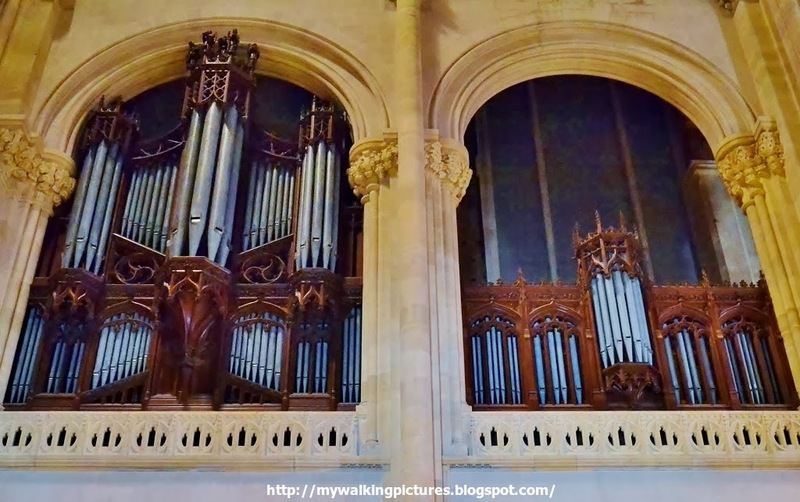 At the Choir section, some of the pipes of the cathedral's Æolian-Skinner pipe organ can be seen. 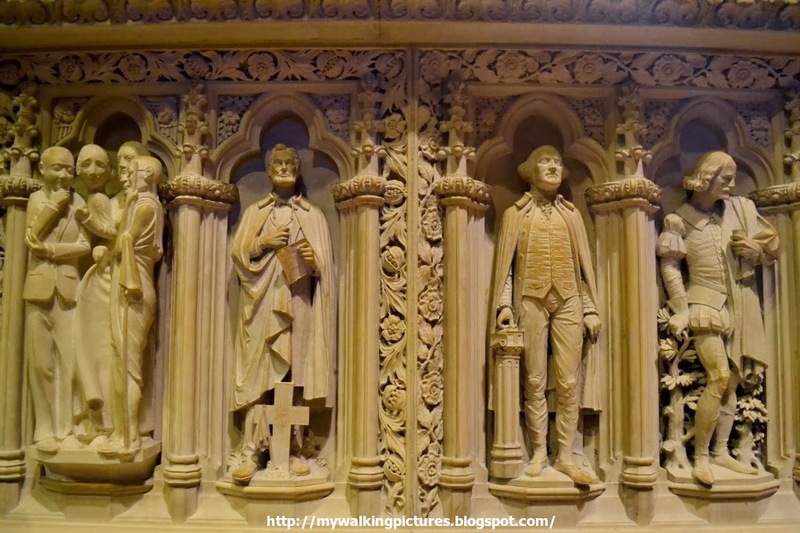 They surround the choir stalls and range from the size of a pencil to 32 feet tall. Between the Crossing and the Choir is the Delafield Memorial Parapet, consisting of figures, each of which in a separate niche, represents the outstanding Christian in each century. These figures attract a great deal of attention, running, as they do, from St. Paul to Abraham Lincoln. In previous years, crowds of visitors stand in front of an uncarved granite block which represented the 20th century, wondering whose face and figure will be carved there to represent the one who did the most for Christian civilization in our generation. Four figures has been carved out of the granite block - Martin Luther King Jr, Albert Einstein, Susan B Anthony, and Gandhi now represent the outstanding Christians of the 20th century. Located west of the first of the seven chapels of the Cathedral is the Stuyvesant Memorial Baptistry. It is a gift of the descendants of Peter Stuyvesant, the last Dutch Director General of the New Netherlands, which was the former name of New York. RUNNING all around the Choir, behind the stalls and the Altar, is a passageway called the Ambulatory. This forms a sort of ring around the head of the Cross, and from it, like rays, spring the Chapels of the Tongues. Seven chapels radiating from the ambulatory behind the choir are each in a distinctive nationalistic style, some of them borrowing from outside the Gothic vocabulary. These chapels are known as the "Chapels of the Tongues". The designs of the chapels are meant to represent each of the seven most prominent ethnic groups to first immigrate to New York City upon the opening of Ellis Island in 1892, the same year the cathedral was begun. 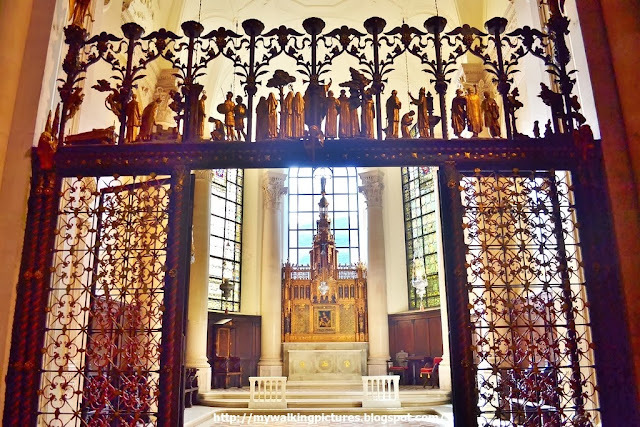 Proceeding east from the Baptistery is the chapel honoring St. Ansgar, an Archbishop of Hamburg-Bremen and the patron saint of Denmark. The see of Hamburg was designated a mission to bring Christianity to Northern Europe, and Ansgar became known as the "Apostle of the North". Swedish, Norwegian and Danish services may be held in this chapel which is dedicated to the Scandinavian people who immigrated to the United States looking to begin a new life. Adjacent to this is the Chapel of St. Boniface, who is the patron saint of Germany and the first archbishop of Mainz. He is regarded as a unifier of Europe, and he is seen (mainly by Catholics) as a German national figure. I don't know who the figures are on the stained glass windows of the chapel but these are beautiful. Next to this is the Chapel of St. Columba, patron of Ireland and Scotland. The chapel is dedicated to the use of the British group and those from the British isles. 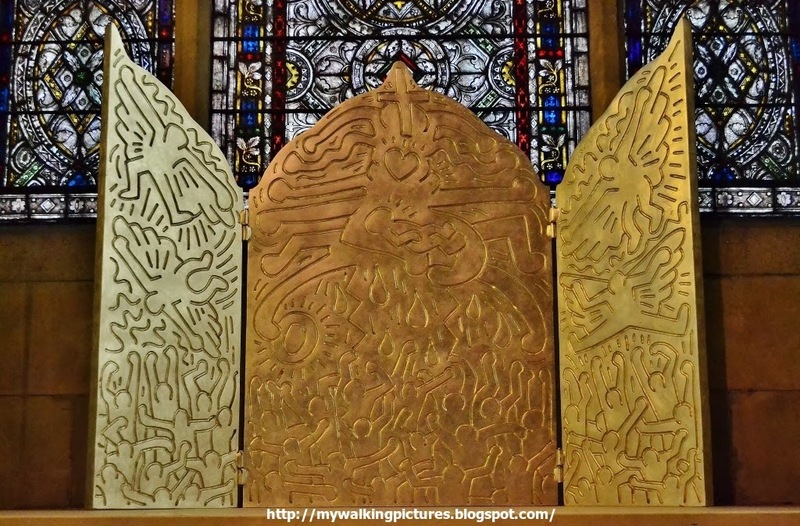 At the center of the chapel is one of Keith Haring's last work, a triptych cast in bronze and covered with gold leaf. Haring died two weeks after completing the altarpiece. The uncharacteristically solemn altarpiece reflects the artist's coming to terms with his own mortality and his grief over the death of friends. 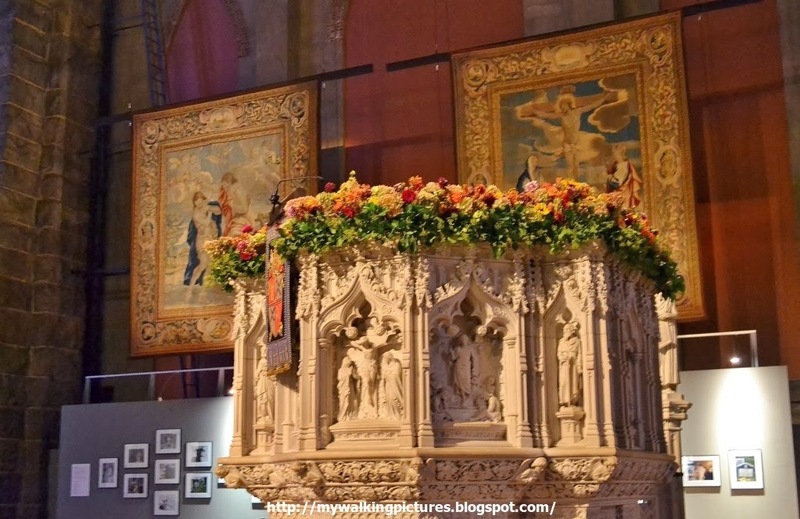 Haring's funeral was held in St. John the Divine. Forming the apex of the cathedral is the Chapel of St. Savior (Holy Savior), devoted to immigrants from the east, especially Africa and Asia. It is located at the easternmost part of the Cathedral and was the first to be built in 1904. The outstanding features of this chapel are the magnificence of the window, the purity of the white marble Altar, the right angel of the four supporting, which has the likeness of Major Belmont's first wife, and the brilliant splendor of the bronze colored Reredos behind it. All of these chapels have a metal gateway or screen, beautifully figured in the highest artistry of the metal worker, each different but with similar designs to the other gates. 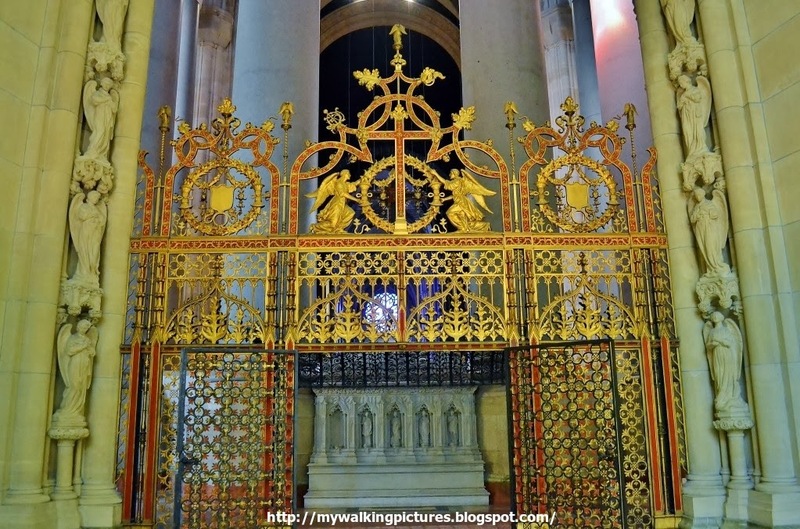 This is the gate for the Chapel of St. Savior, with golden angel figures near the top and intricately carved designs. There are figures bordering the entrance to the Chapels of Saints Savior and Columba. These were sculpted by Gutzon Borglum, sculptor of the Mount Rushmore National Memorial. The next chapel is the Chapel of St. Martin of Tours, and is dedicated to French services. It contains what is thought by many to be the most beautiful windows in the Cathedral. The sixth chapel is the Chapel of St. Ambrose, who was an archbishop of Milan and became one of the most influential ecclesiastical figures of the 4th century. He is the patron saint of Milan. 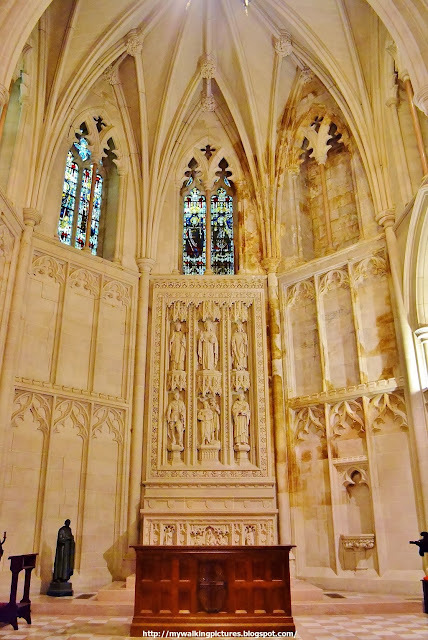 The Chapel has a beautiful alabaster altar and a heavy gilt reredos behind it. This chapel's metal gateway represents across its lintel scenes in the life of St. Ambrose, the figures all being cast in bronze. We were not able to go to the last chapel, the Chapel of St. James, patron of Spain, as it was cordoned off probably for a private event. Also in that area is one of the cathedral's highlights, the Memorial to September 11 by Meredith Bergmann. Hopefully, the next time I visit the cathedral I can take some pictures of this memorial. Since the Cathedral is still unfinished, it still doesn't have transepts, which will eventually spring out from the Crossing to form the arms of the cross. 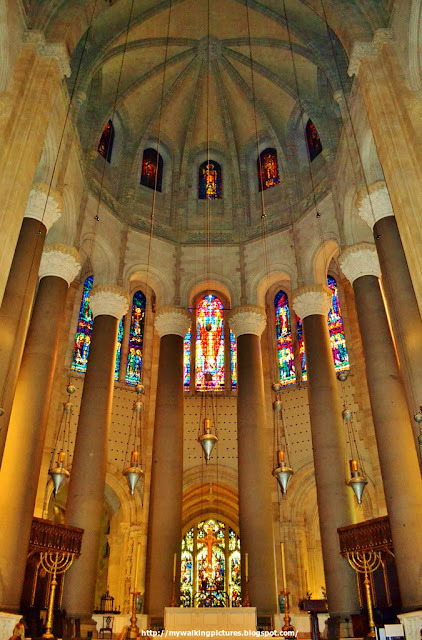 For now, only the Crossing is finished but standing there, the visitor's eye will be drawn to the apse and its the tremendous pillars which form a kind of crown behind the altar. 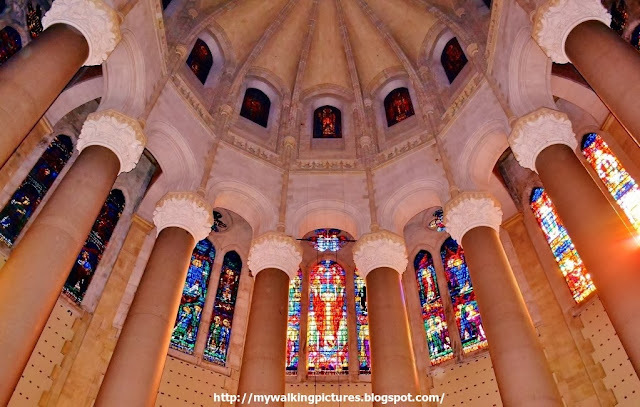 The eight granite columns that surround the high altar were quarried on the island of Vinalhaven in Maine. Each is 55 feet tall, six feet in diameter and weighs 130 tons. Stained glass windows with biblical figures can be seen in between the pillars. At the center is Christ of the Second Coming. 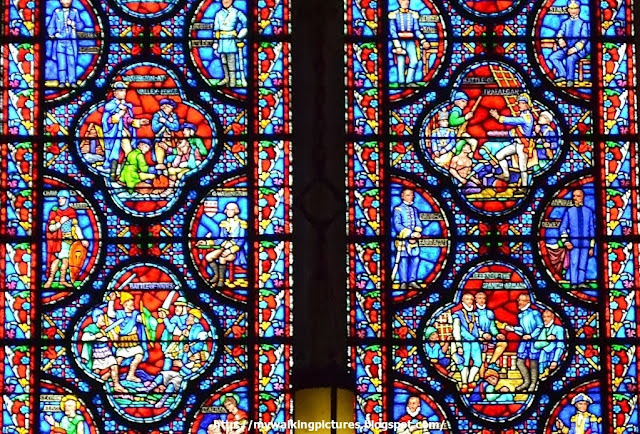 Installed in 1932, the largest stained glass window in the country contains more than 10,000 individual pieces of glass. The design features a red-robed image of Christ at the center, from which trumpet-bearing angels radiate outward to the prophets. The altar and reredos, which they overshadow, are both of white marble and the proportions may be gathered from the fact that the center figure of Christ is over five feet tall. 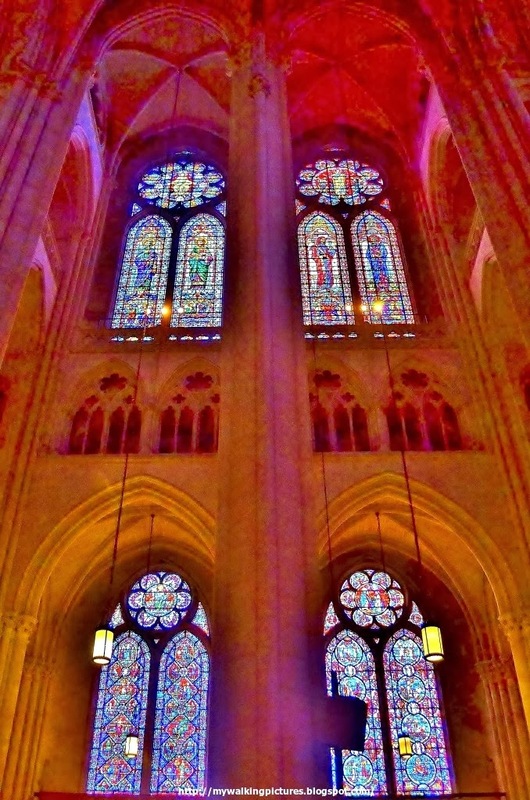 The Cathedral's apse has seven hanging lamps, a reminder of St. John the Divine's vision of the throne of God, before which seven lamps are burning. There are some items in the altar which were donated to the Cathedral, like the menorahs and Japanese vases at the far end of the picture, next to the two center pillars. Another pair of items donated are two Siamese book cabinets. This is the view from the Crossing, looking west at the Rose window. The shallow dome that covers the Crossing was erected as a temporary roof by Rafael Guastavino in 1909 and took only 15 weeks to complete. The Statue of Liberty, without her pedestal, would fit comfortably under the structure. The Highlights Tour comprised the stained glass windows, the seven chapels and the highlights on the altar. After the tour I stayed on a little bit to take more pictures, especially some of the items on the south side of the cathedral. At the Earth Bay of the cathedral are 24 wall-mounted, individual bronze reliefs created in 1988 that compose Peter Gourfain’s The Fate of the Earth. They depict scenes of environmental destruction and conflicts over disappearing natural resources. 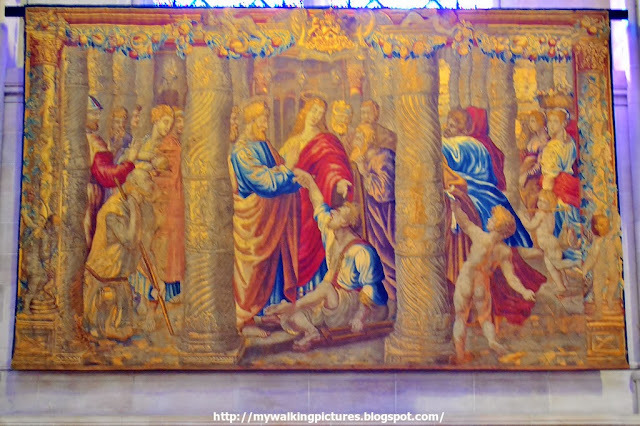 The Cathedral is also the owner of the Mortlake Tapestries, two of which are currently on view. The one shown below is "The Healing of the Lame Man" which is on display at the Communication Bay. Woven from English wool by Flemish loom operators following cartoons created by the renowned High Renaissance artist Raphael, the Cathedral's Mortlake tapestries (17th century) depict scenes of the acts of the Apostles drawn from the New Testament Book of Acts. This confluence of English wool, Flemish hands, and Italian designs distinguishes the Mortlake tapestries as among those that were created during the golden age of tapestry-making. The 15th-century German choir stalls separating the narthex from the nave are on permanent loan from The Metropolitan Museum of Art. 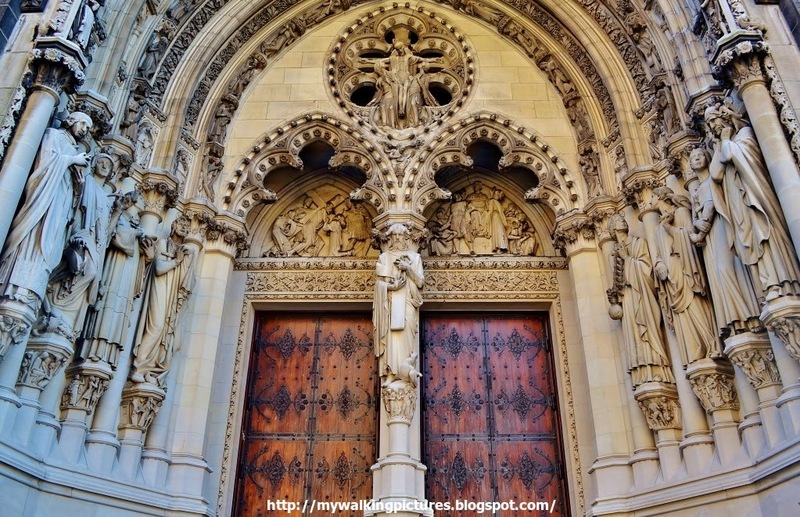 The stalls demarcate the entrance from the body of the Cathedral, and have elegantly carved details. There are other highlights in the Cathedral like the Firemen Memorial dedicated to all firefighters in 1976, and gained new resonance in the wake of September 11, and the Altar of Peace, which was crafted from the trunk of a 300-year-old Black Walnut tree and consecrated to world peace in 1986. There are other items as well, not listed in the Cathedral's webpage but are on display, like this book, with its own ornately carved bookcase and tucked near the Missionary Bay. I don't know if it is the "Golden Book" mentioned at the end part of this link. 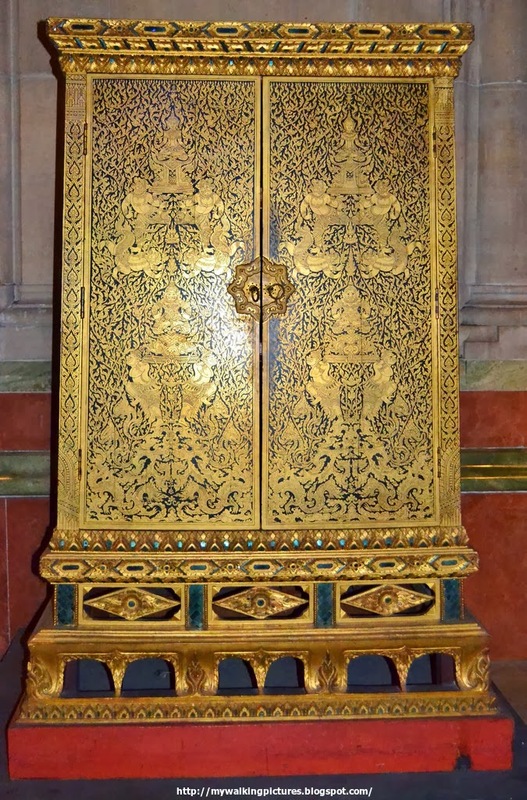 Near at hand will be a beautifully executed niche, containing "The Golden Book" in which are to be inscribed the names of all donors, irrespective of the amount of their donation. Thousands and thousands of names will be inscribed in this memorial book, representing every section of the life of this city and nation and the world, and, towering above it, will be the Children's Arch, built by the donations of the children who have become so much interested. 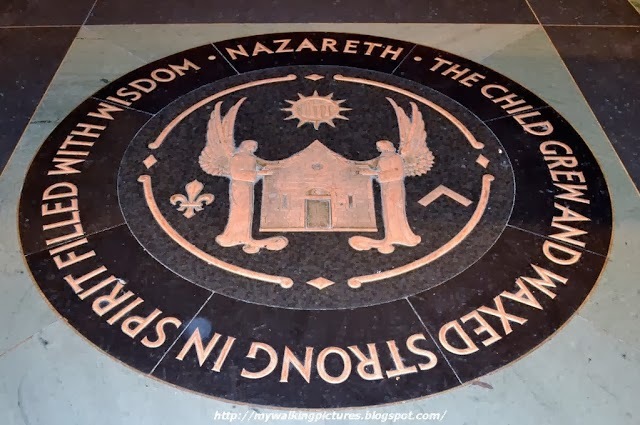 On the floor of the Cathedral run three aisles of bronze floor medallions, collectively referred to as the Pilgrims' Pavement. 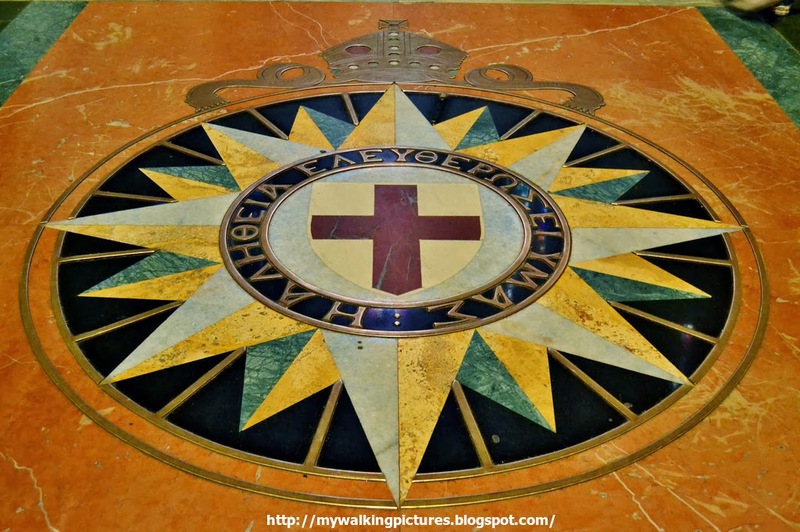 The side aisle medallions show the names and crests of key pilgrimage sites, as well as significant sites in Anglican history, while the central aisle marks the miracles performed by Jesus, from birth through the Feeding of the Multitude at Bethsaida. The pavement should end with the Resurrection, but is truncated by the unfinished floor of the crossing. 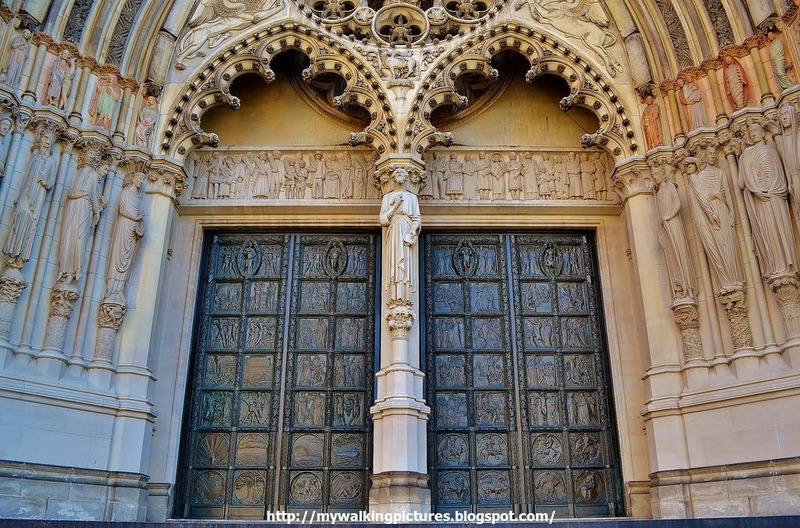 At the west front of the Cathedral facing Amsterdam Avenue are three entrances, the main entrance is known as the Great Bronze Doors. The doors are opened only twice a year: on Easter and in October for the Feast of St. Francis. These doors were designed between 1927 and 1931 by the designer Henry Wilson and were installed in 1936. Cast by Barbadienne of Paris who also cast the Statue of Liberty. 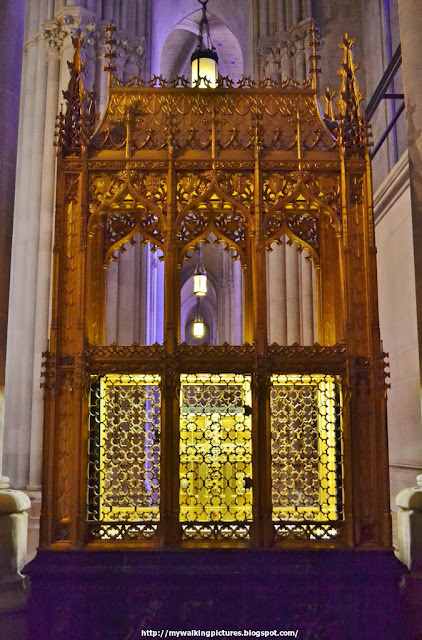 Each door is 18 feet high, six feet wide, and weighs three tons. 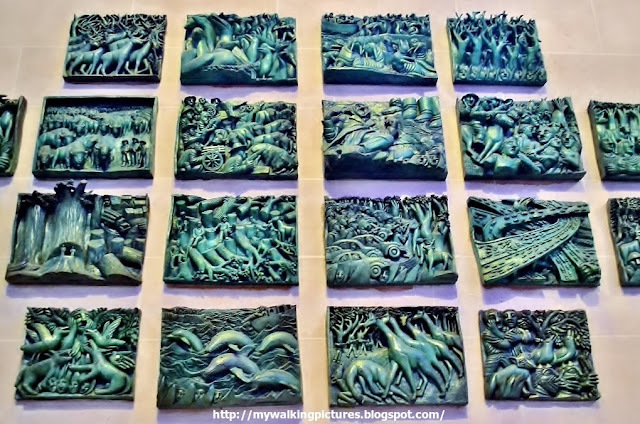 The doors’ 60 bas-relief panels depict Old and New Testament stories on the exterior side, and flowers, birds and natural imagery on the interior side. Carved on the trumeau of the main entrance is St. John the Divine, the author of the book of Revelation. He is depicted holding a quill on his right hand and a paper on his left and looking up above him to the tympanum which shows the Transfiguration of Christ. Under his feet are the four horsemen of the Apocalypse. Here is a close-up photo. Framing the Great Bronze Doors are two rows of Gothic-inspired sculptures, known as the Portal of Passion, that were carved in the 1980s and '90s by British artist Simon Verity. The 32 carved Biblical figures seen on the 8-foot and 3-foot stones represent kings, prophets, judges, farmers, musicians, parents, children, rich and poor. The figures face each other in the semi-circle of the doorway: Deborah lifts her veil to call out her warnings; Abraham stands next to Sarah, with his hand placed over her pregnant belly; John the Baptist is draped in animal skins; Noah holds an unfinished ark, looking backward at the unfinished cathedral. The bases and capitals surrounding the larger figures feature numerous topical, witty, yet timeless, symbols: a vision of the west front of the unfinished St. John the Divine; a pianist's hands; a DNA spiral; personal messages from the artists. The description above is from the photojournal of the project. However, in keeping with the theme of St. John's Revelation, there are sections of the sculptures that depict the New York City skyline being destroyed, including New York City engulfed by tidal waves and Brooklyn Bridge cracked in two. 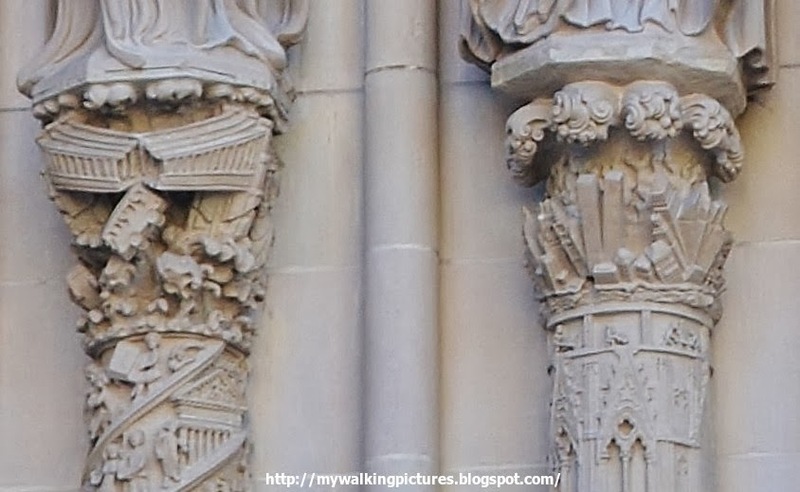 On the central pillar of the north portal is the figure of St. Peter. 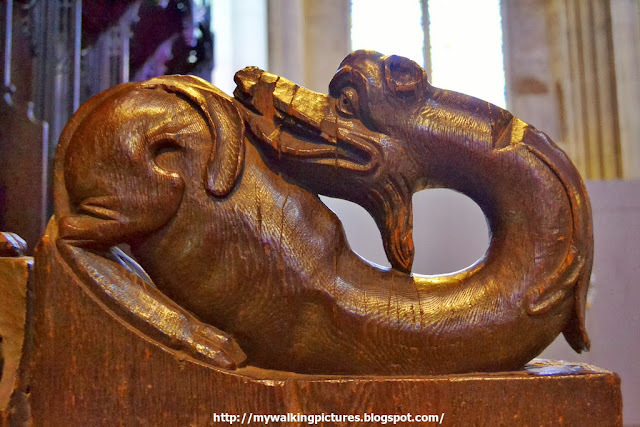 At his feet is a rooster and at the bottom are carvings depicting the scene where St. Peter denied knowing Jesus. Here is a close-up photo. 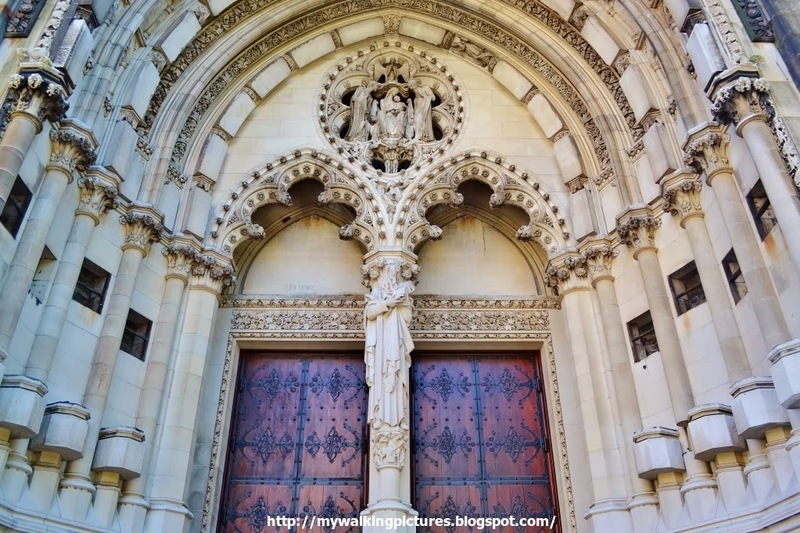 All the figures in the north portal above, as well as St. John the Divine in the main portal, were created by John Angel. The south portal is still unfinished, note the empty frames. I don't know who the figure is carved on the trumeau, but he is holding a thick book. 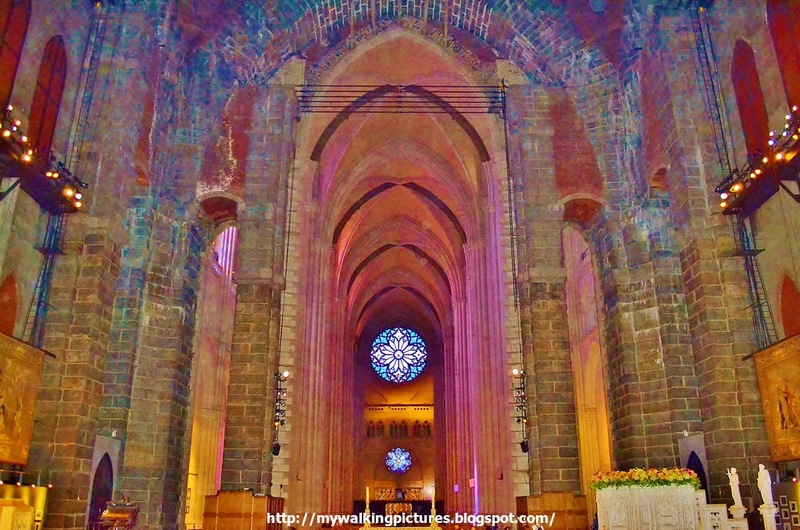 Some refer to the Cathedral of St. John the Divine as St. John the Unfinished. The cornerstone for the church was laid in December 1892 and 120 years later, a lot still has to be done. The Cathedral's website has a great summary of its construction. 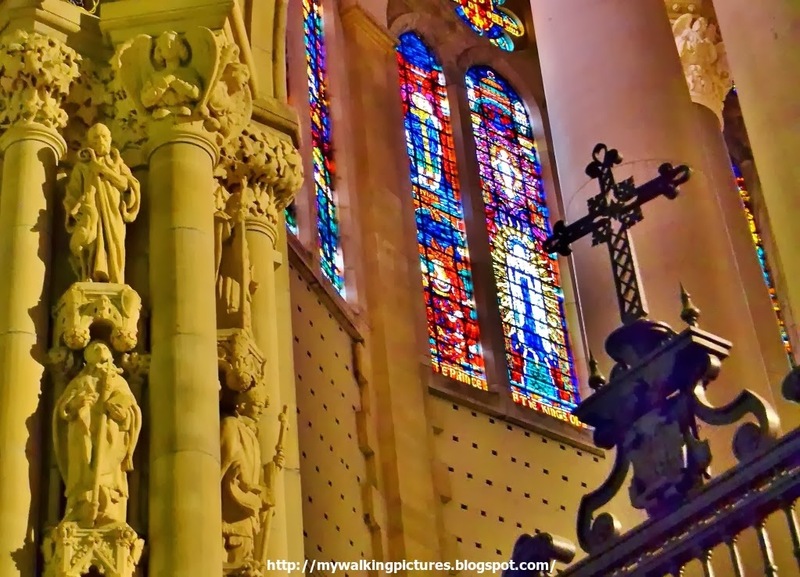 It may be unfinished but with what I have seen, the Cathedral is magnificent, with painstaking details at every corner, and a lot of architectural traditions and symbolism, which were intended to affect a visitor’s experience. I hope I can see the Cathedral finished in my lifetime. If not, I still count myself lucky to have visited and seen its many wonderful highlights. Thank you Open House New York!